Audiences love to be engaged with rich visual images and bright colours. Since 2004, Signbox Microsystems has been working with the biggest names in the entertainment industry to ensure audiences don’t have to be in their seats before being captivated by what’s on the screen. 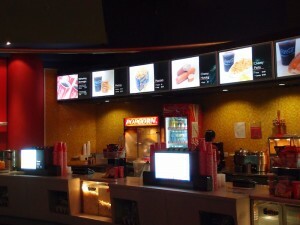 Now the leading supplier of digital signage solutions to cinemas, theatres and other entertainment venues across Asia and Australia. Signbox Microsystems has truly brought a new dimension to communicating with an audience. Flashing images and colourful lights will attract people’s attention more so than static notice boards ever could. 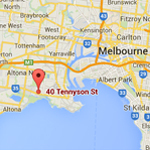 Displaying pertinent and up-to-date information will hold that attention. signBox digital signage solutions can be used to keep the public informed of show times, ticket costs, seating availability and special ticket offers on any given night. Previews of feature films and video clips of cartoons will attract children and keep them entertained right up until it’s time to take their seats. Paper-based advertising solutions such as notice boards, leaflets and posters don’t afford the same flexibility as a digital signage solution. The ability to adapt your message according to the audience on hand opens up the possibility of generating interest in upcoming events, as well as what’s currenly on offer. Run trailers from upcoming attractions, as well as the movies currently showing. Appeal to the younger members at your venue by showing images of the goodies available from the candy bar. Or run in-house promotions on merchandise, gift vouchers, popcorn and drink combos, the newest hot food available at your cinema…the list is endless. What’s more, you can change the displays within seconds to suit the type of audience you have in the building. Whether the requirement is for a single-screen cinema, small theatre or giant multi-plex, signBox digital signage solutions can be tailored to suit. Understanding the need to keep start-up costs to a minimum, our system enables a single PC to deploy information to different screens across a signage network. Different content can be sent to different screens, from one player. With the built-in templates, the learning curve when implementing the new solution is minimal, so there’s no need to hire additional staff or train existing employees to run the system. With the signCine module, venues are able to create displays that constantly updates information on what’s showing, seating times, ticket prices, availability of tickets, future performances and so on. 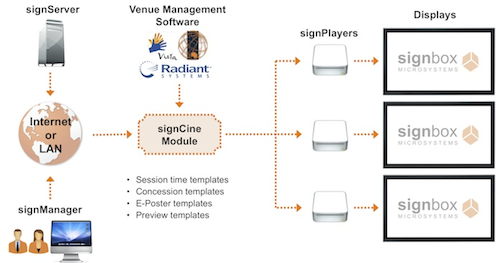 signCine extracts the information required automatically from the existing venue management system and displays it in a design of your choice.